As we approach the Conference (March-8th) we are looking to walk the talk. The conference has now a green event certificate by the University of North Carolina Division of Finance and Administration. Details on what that means can be found at the UNC Web site. Poverty eradicationFood security and nutrition Health and population dynamicsEducationGender Equality and women’s empowermentWater and sanitationEnergyEconomic GrowthIndustrializationInfrastructureEmployment and decent work for allPromoting EqualitySustainable Cities and SettlementsSustainable Consumption and ProductionClimateMarine Resources, oceans and seasEcosystems and biodiversityMeans of ImplementationPeaceful and non-violent societies, capable institutions The Co-chairs paper with much more detail can be downloaded from the UN web site. I would like to thank the President of the General Assembly for inviting me to share my thoughts today in this thematic debate. 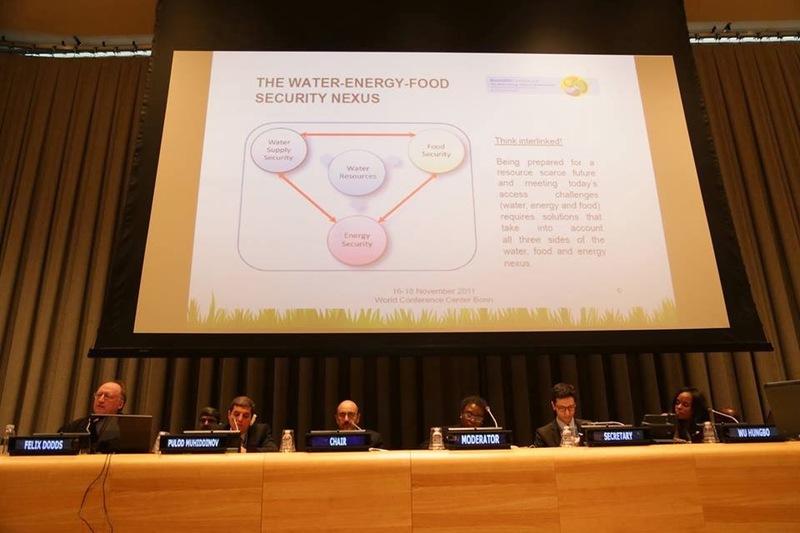 I had the pleasure of sitting on the Advisory Board for the German Nexus conference in 2011 and that leadership inspired Jamie Bartram former Chair of UN Water and myself to organize the 2014Nexus Conference on Water-Energy-Food and Climate on the 5-8th ofMarch in Chapel Hill I hope you will all come down and continue the discussion. We have a number of outputs one of which is a declaration dealing with the Nexus which you will find copies of at the side in its first draft.